Niall Morgan has scored two points from play for Tyrone in the league so far. 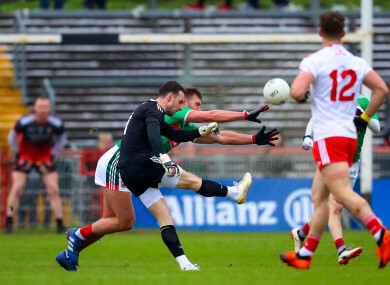 Niall Morgan kicks a score against Mayo under pressure by Aidan O’Shea. MICKEY HARTE SAYS he’ll continue to encourage Niall Morgan to come out as a 15th outfield player for Tyrone once the opportunity presents itself. The goalkeeping position has undergone a dramatic change at the top level over the past number of seasons, but Morgan reached new heights in the league this season. The Edendork man landed points from play from 40 metres in the defeat to Mayo and from 55 metres to salvage a draw against Roscommon last month. “Niall plays a lot of football out the field for his club so he is comfortable doing it,” said Harte at the launch of the 20th annual KN Group All-Ireland GAA Golf Challenge. “There is a risk and a gamble in doing it, but the fact that he is comfortable – there are some goalkeepers that when they leave the line, people don’t think it is a good idea and they hold their breath – that’s not the case with Niall. He is comfortable playing football outfield. It is not as if it is a major masterstroke or plan or anything else. If there is an opportunity for him to come out the field, and he is comfortable doing it, then he has the license to do it. On Saturday, Tyrone face league holders Dublin in a repeat of last September’s All-Ireland final. Harte’s record against Jim Gavin now stands at one win, two draws and five losses from their eight clashes since 2013. But his belief in this Tyrone team hasn’t wavered despite their failure to defeat the All-Ireland champions in recent years. “I suppose we feel, even though we ended up getting beat by six points in an All-Ireland final, I think we acquitted ourselves so much better than we did in the semi-final the year before. So, that’s where it’s at at the moment. Experience against the best is a good thing anyway. Yes, you don’t want to be beaten and you don’t want to be overhauled in the way we were perhaps in that semi-final. “But, getting games against a team like Dublin who are the best in the last four or five years, without question or doubt, they’re always good games to get – regardless of the outcome. “Because you’re certainly learning a lot more about yourself and your players than you would by playing against teams that you know you can handle or manage. So I think there’s a lot of benefit in playing Dublin, regardless of the outcome. “We’re not big into mental scars in Tyrone, particularly the group of players that I’ve worked with over the years. We’ve had many, many setbacks in various ways and really we don’t get scarred by results in football in that sense. “We just try to learn from them and maybe in a way it makes you more determined to want to change the outcome, not necessarily to change it form a bad defeat to a win but to change it to a better place. “I suppose we are renowned for having nippy inside forwards that are good on their feet and are nice, accurate players,” he said. “Maybe we generally had too many of them. “We’re always compared to the team that had Stephen O’Neill and Peter Canavan and Brian McGuigan, a forward line which had a lot of different high quality players. But they only come along once in a generation. I think everybody recognises you get those once in a generation, and particularly in numbers. “We don’t necessarily have people to compare to them, but what we want is players who can learn from what they see those boys do. And learn to give the best of themselves. “I am not saying we throw out all our small players but we need a better balance so therefore, you don’t have a line where it is all the same kind of skilful, accurate, fast players who need the precise pass. “Maybe you need to mix and match with the bigger and stronger player who can handle an average ball but you need all of those. You can’t have all the big strong men either, because they wouldn’t be as deft or as astute as finding the scoring opportunities as the Mark Bradleys, the Lee Brennans, the Darragh Canavans or (Darren) McCurrys. Harte confirmed that Mark Bradley, who started the All-Ireland final against Dublin, won’t be part of his plans this year due to his studies but expects the forward to return in 2020. In his absence, both Peter Harte and Mattie Donnelly have been used closer to goal. It’s something he feels is a “work in progress”. “People used to always talk about a settled team and how this was the mark of a great team. Not anymore, in the modern game, a settled team would be a weakness. I think you need to be able to have players there that give their best and then you have someone to replace them that adds value. So it’s a very fluid game and you certainly need your 20 players now to be able to play at a high level. Email “'There is a risk and a gamble in doing it' - Fly-goalie Morgan 'has the license' to join Tyrone attack”. Feedback on “'There is a risk and a gamble in doing it' - Fly-goalie Morgan 'has the license' to join Tyrone attack”.